2250Watt Solar Modules array – 10 Year manufacturer guarantee, 25 years 80% yield. 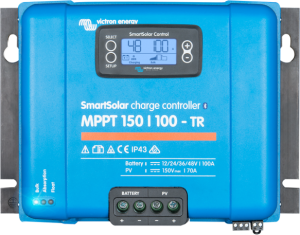 1 x 85Amp MPPT-TR (Maximum Power Point Tracker) – 5 Year Manufacturer Guarantee. 530Amp 2V Flooded Lead Acid Cells. Based on primary usage being consumed during the day these units will have the capacity in storage to support 3-4kWhrs per night and/or when Mains is unavailable to run approximately 9kWhrs before Eskom comes back online again. 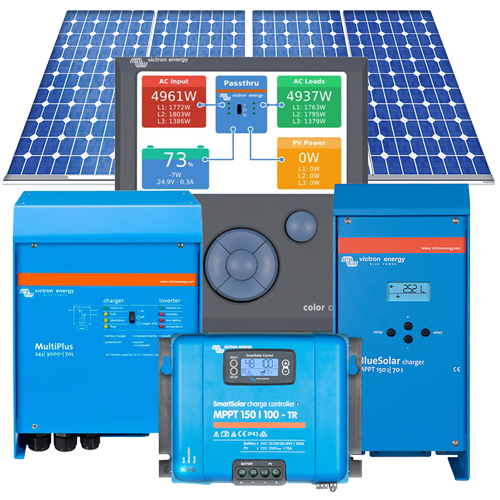 To achieve an average energy input solar generation of 12kWh/day with PV solar modules in George, Western Cape South Africa, Specialized Solar Systems recommends a PV solar module array capacity of 2250Watt, at a fixed tilt angle of 34°. 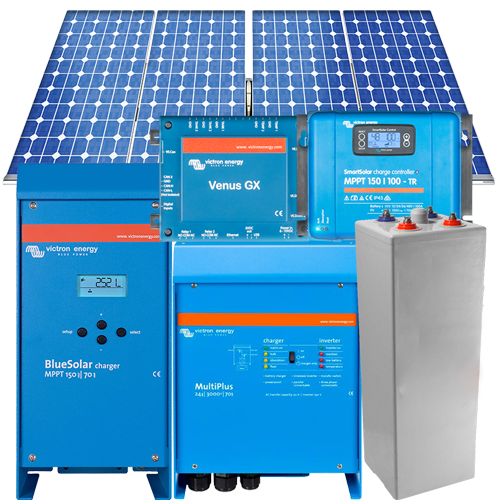 Specialized Solar Systems PV solar modules have a 10-year manufacturer’s product guarantee and a terrestrial 25 year 80% yield. Lithium Iron Phosphate (LiFePO4) – No one can afford to be outside of this revolution! It is not a case of LiFePO4 being affordable, it is a case of can one afford to use lead acid? The life cycle cost of LiFePO4 batteries is a quarter of lead acid batteries. The upfront costs for a pack vary from similar to 50% more for lithium depending on the application, but one must consider that in 3 to 6 years’ time the lead-acid batteries must be replaced and the LiFePO4 battery will last 15 to 20 years depending on the application. LiFePO4 technology has revolutionised the potential and life cycle cost of operating battery-based power systems. LiFePO4 has a cycle life 10 times that of typical deep cycle lead-acid batteries. They only cost 10-50% more to purchase upfront (depending on size), however, the saving on life-cycle cost is massive. LiFePO4 batteries from Freedom Won are available in a wide range of sizes to accommodate loads of a few amps to over 2000 amps. They can deliver sustained high power without excessive heat generation. There are no gases released and LiFePO4 cells are also thermally stable. They can be charged repeatedly to full capacity in less than 60 minutes with no appreciable loss in performance. Lithium Iron Phosphate cells, or LiFePO4 for short, are now dominating the alternate energy storage sphere amongst the more discerning designers and customers in the more advanced markets including Europe, Australia and South Africa. Freedom Won has been using these cells in electric vehicles since 2010 and in stationary storage since 2014. Freedom Won provides competitive prices made possible by high volume manufacturing in South Africa and guarantees market leading technical backup and design assistance. Freedom Won has the market leading battery warranty of 10 years with no fine print or diminishing value spurred by our confidence gained from our own test programme in electric vehicles, which is far more demanding on the batteries than stationary power systems. 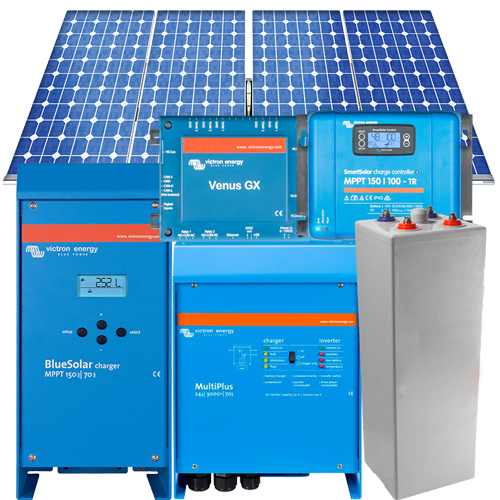 The expected life in off grid systems is more than 15 years, and more than 20 years in grid connected back up installations with occasional cycling. The end of life is defined by when the cells contain 60% of their Beginning of Life (BoL) capacity. The capacity deterioration over time is linear (the deterioration does not become substantially more rapid with extended use), and the cells could therefore be used for even longer periods if a lower end of life capacity is acceptable. 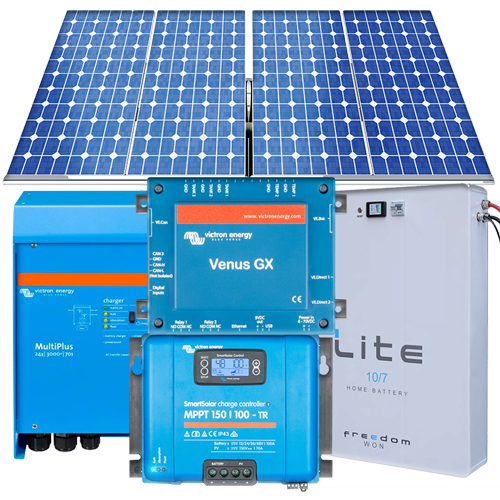 The initial cost of installing a LiFePO4 system as compared to Lead batteries is only marginally higher since the 2018 price decreases in the Freedom Won range. For smaller batteries up to 10kWh this premium is about 40% but for batteries larger than 100kWh this premium is only about 10%. These premiums in initial cost are dramatically overshadowed by the savings in the total life cycle cost, calculated as a cost per kWh delivered by the battery pack during its lifetime. The lifetime cost per kWh can be as low as 25% of the cost of typical lead acid deep cycle batteries. The main reason for this is that the cells offer up to 10 times the number of cycles than your average deep cycle lead battery and as much as 5 times that of the more robust single cell flooded lead acid types. Another top benefit to the customer is the far greater efficiency of the LiFePO4 technology, which is typically better than 98%. A typical efficiency for lead batteries is 65%, although this can be as low as 55% in a house PV system where the Depth of Discharge (DoD) is limited to 20% as a measure to lengthen the life of the lead acid cells. In a grid connected back up scenario this high efficiency results in significant energy savings when recharging the batteries, and in a Photo Voltaic (PV) installation it enables a reduction of the size of the array by as much as 30% with the same usable energy. The advantages of LiFePO4 cells over lead cells are extensive so a full elaboration is not included in this article. A summary is however provided in the table below, and further questions posed to Freedom Won will be welcomed. 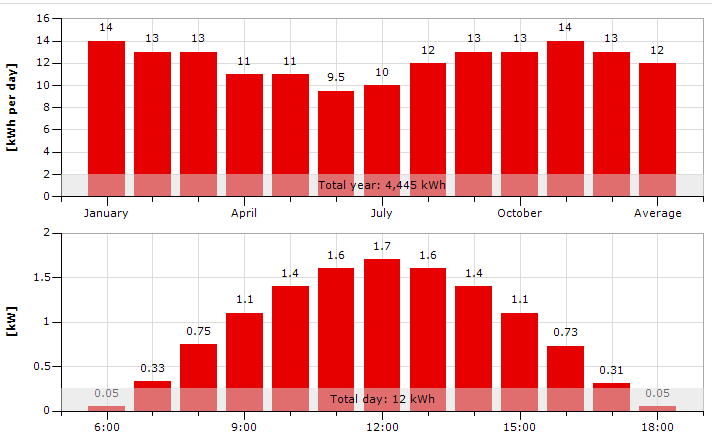 Charge – discharge (round trip) efficiency [%] 60-70% typical depending on current. 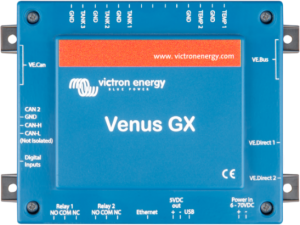 Typically rated capacity is based on 10 hour discharge (C10) 96%, consistent throughout current range. Rated capacity is based on 20 minute discharge (3C), a one hour or longer discharge will actually give 10% more than the rated capacity. Temperature resilience Poor – temperatures above 25 deg C significantly reduce the calendar life Excellent – ambient temperatures up to 45 deg C will not affect the life of the cell at all. Up Front Cost Cheaper 10 to 50% more expensive up front than Lead Acid depending on what lead acid cells are used for comparison and the size of the battery – the Lithium premium on a larger Freedom Lite battery is lower. When sizing a LiFePO4 pack, the rating of the cells cannot be compared to a typical lead acid rating without making some adjustments. Owing to the much higher efficiency and the ability to discharge more deeply without rapid capacity deterioration over time means that a LiFePO4 can be sized to about 50% of the lead battery in terms of Ampere hours. 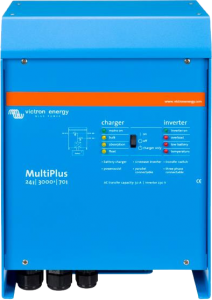 This factor originates simply from the fact that only 65% of the rated total energy is available from a lead acid battery in most high power backup applications, whilst 100% of the rated energy is available from LiFePO4 cells. Because it is practical to use a lower DoD in LiFePO4 cells and still achieve an excellent cycle life the designer can reduce the LiFePO4 pack size and still provide superior performance over a lead battery pack. A typical scenario could be 50% DoD for a lead acid pack compared to 70% DoD for a LiFePO4 pack. This ultimately makes the LiFEPO4 pack energy capacity (kWh) rating 50% of the lead acid rating. LiFePO4 cells maintain their rated nominal voltage for about 95% of the discharge, whilst a lead cell voltage drops continuously. When working out the Wh of a lead 12V battery one must use about 11.4V for the average voltage under load (1,9V per cell). The nominal voltage for LiFePO4 is 3.2V per cell or 52V for a typical “48V” system. An example comparing a 200Ah LiFePO4 pack to a 400Ah lead pack is included in the below table. The theoretical energy capacity for the lead battery is reduced to 85% of the rated capacity to replicate a real world discharge scenario vs the manufacturer’s 10 hour constant current test regime used for the nameplate Ah rating. The usable capacities are adjusted to be in line with the typical DoD expected in the design of 50% and 70% for the lead and lithium examples respectively. The LiFePO4 pack costs only 40% more than the Lead battery, however, after taking into account the cycle life and the kWh produced in the lifetime of the packs it is clear that LiFePO4 costs only 22% of the Lead batteries used in this example.